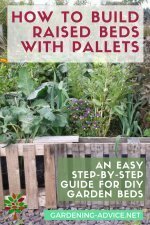 Vertical gardening ideas for growing lots of delicious vegetables in a small space. 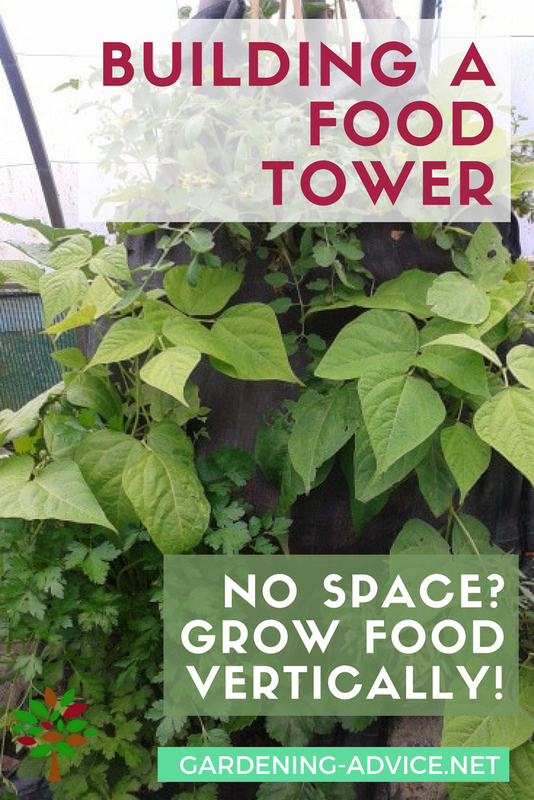 How to build a food tower and tips for vertical vegetable gardening. 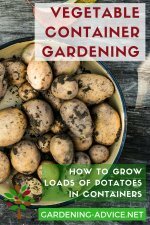 If you are limited in garden space and want to achieve a maximum crop you obviously have to think about other options than a level garden bed. We found ourselves in a situation where we had a limited narrow space left in one of our polytunnels. Between a raised bed and a table we had about 6 ft. This is a bit too narrow to build another raised bed. We decided to experiment with a vertical vegetable gardening. 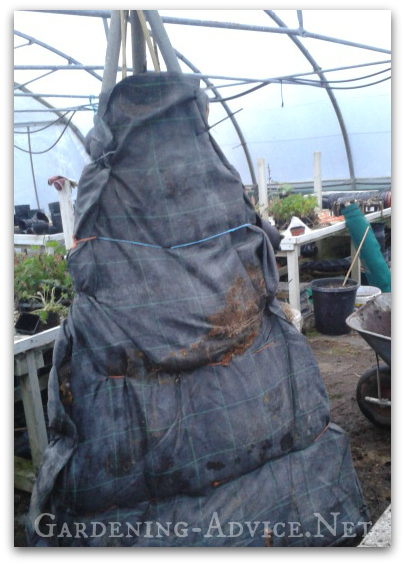 The idea was a pyramid shaped tripod filled with soil and compost that would grow a mixture of vegetables and herbs. All the materials we used were recycled. We found the steel poles behind our shed. God only knows how long they had been waiting there for this project! Some leftover weed control fabric made the cover. The only other things we needed were bamboo canes, wire and some strong string (we used baler twine) or cable ties. Cut the 3 steel posts to the same length (approx. 7-8ft length). You could also use timber posts instead of the steel. This is just what we had available. 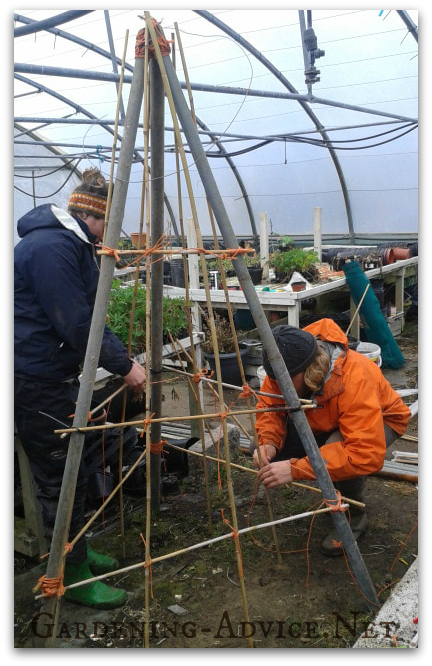 Make a tripod with equal sides and tie the posts together at the top with a strong wire. Use bamboo canes or other sticks and make something like a trellis. This will hold the fabric in place later on. Cover the tower with a strong weed fabric. This has the advantage of being robust, breathable and water-permeable. 'Sow' this onto the canes with the string. Start at the bottom and go about half way up with the fabric. 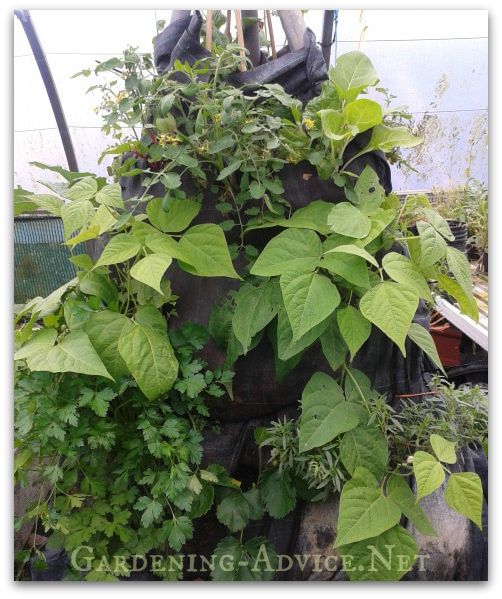 Start filling the food tower with a mixture of soil and good compost or well rotten manure. Water it down in between so you have no gaps. 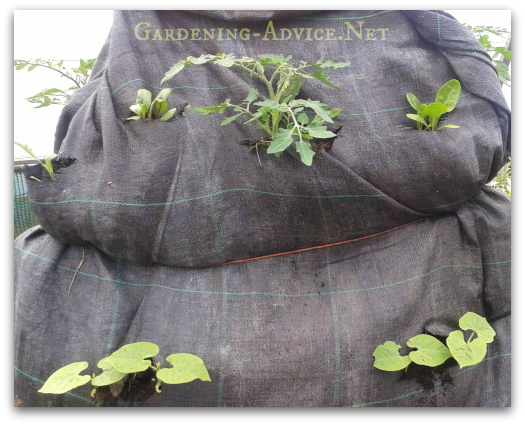 Continue to 'sow' on the fabric and fill the tripod up to the top with more soil mixture. Don't forget to water it down again otherwise you will get a lot of settling later. 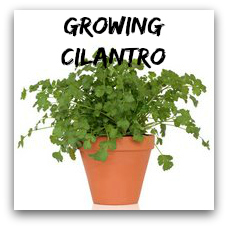 For this type of vertical vegetable gardening, it is best to have your plants started in small pots. 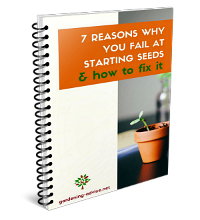 You can start off seedlings yourself or buy already growing plants. Cut a slit into the fabric like an upside down T and carefully insert the root ball of your plant. Firm the soil around the roots and water it in well. 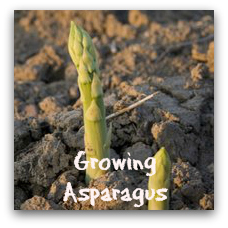 Find a list of suitable vegetables below. You can water the tower from the top and from the sides through the holes you made for the plants. 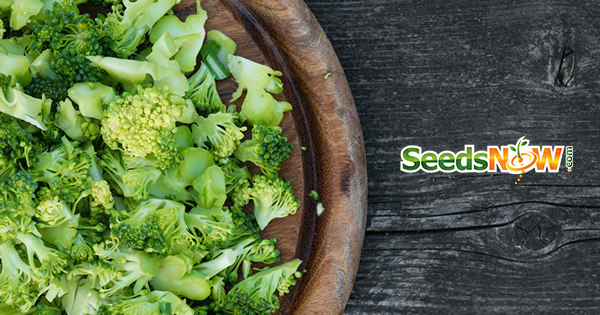 For feeding, you can add some organic fertilizer or compost onto the top. 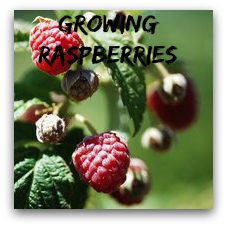 You could even use it for composting and add composting materials like kitchen scraps or leaves in layers on top. They break down and gradually feed the tower...turning it into a worm tower! You can build a food tower like this in a backyard or patio, maybe even on a rooftop garden. 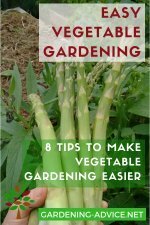 Make sure that you have enough room around the tower to pick your vegetables and for watering. Our space was nearly a bit too tight once the plants started growing. 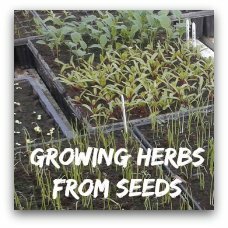 You buy seeds for your food tower here.